Automatic in-line standardizers | Reda s.p.a. The automatic standardizers of the RTM series realized by REDA S.p.A. grant the standardization of milk and cream with the utmost precision. 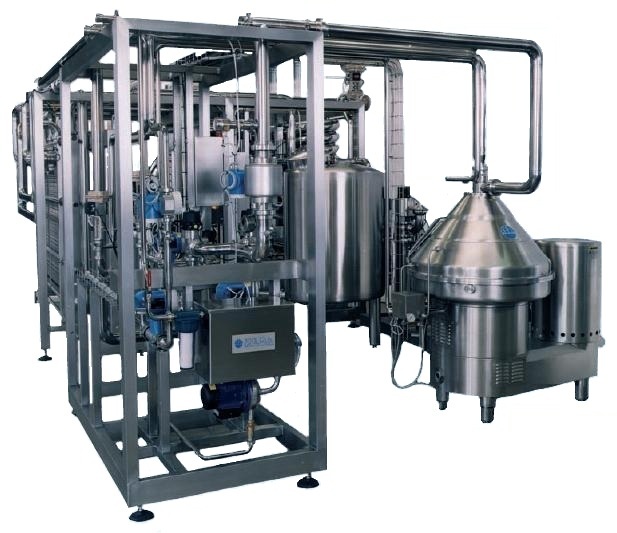 These systems operate normally in connection with a totally skimming centrifuge and are equipped with all needed elements and accessories for the regulation of the same centrifuge: automatic backpressure valve, pressure gauges for milk and cream and sampling taps. Possibility to standardize simultaneously milk and cream. Presence of density measuring devices for both milk and cream. High standardizing precision of both milk (+0,03%) and cream (+0,5%). Option “RTM calibration system” to further improve the standardizing precision. High speed in the regulation of the standardization flows. “RTM flow control” system for a constant and continuous recalculation of the flows. The standardizers are premounted and tested in the workshop before the supply, also in the simplified version (mod. RTC) controlling only the cream fat level. Moreover, special standardizers can be supplied on demand for milk or cream standardization without any connection with a skimming centrifuge, therefore directly from the storage tanks.The standardizers are available with capacities between the 5’000 and the 50’000 liters/hour.